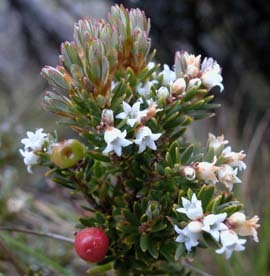 Acrothamnus montanus is a common alpine or subalpine species. The leaves are narrow and blunt, with recurved margins. The petals (corolla lobes) are glabrous, except sometimes for a few papillae. It is easily confused with A. hookeri, and may in fact be a clinal form of this species.